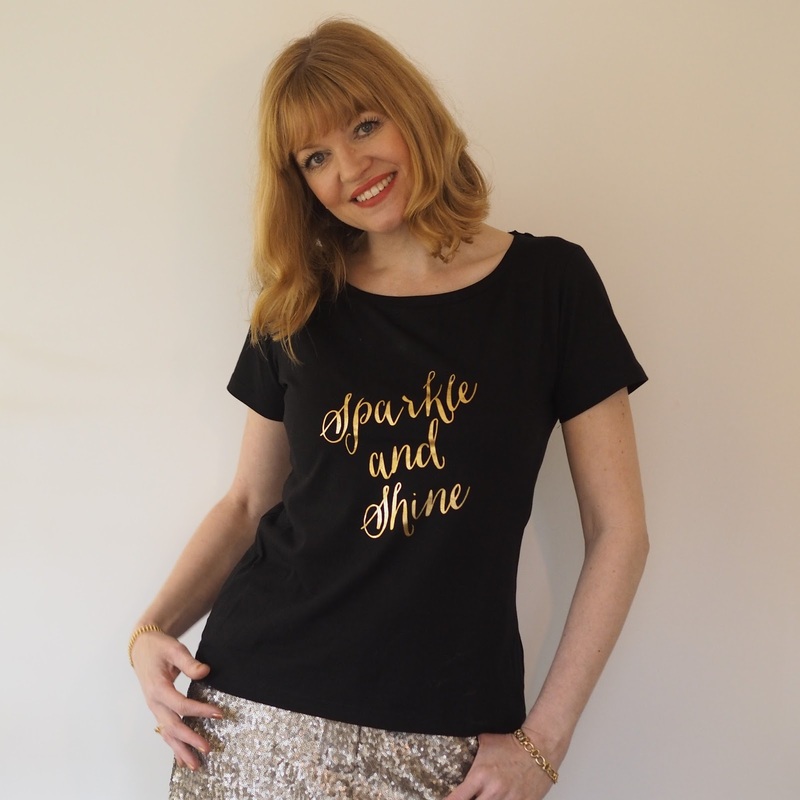 A Sparkle Tee Shirt, A Gold Sequin Mini Skirt and My New Year’s Resolutions. Hello and Happy New Year! I hope you had a fantastic time whatever you did. I can’t believe how quickly it all went. 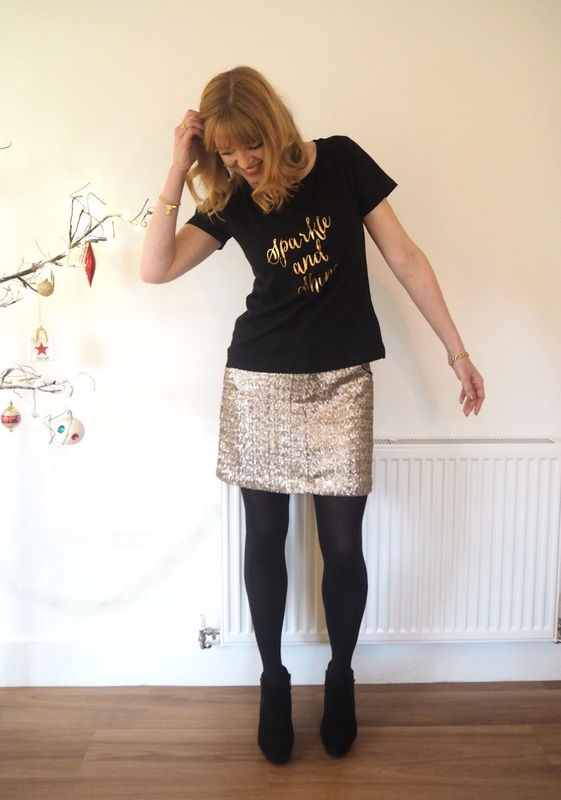 The last blog post I wrote was almost two weeks ago and from then it was a whirlwind of lunches, dinners and drinks with family and friends and after such a fabulous festive season, I’m finding it hard to come back down to earth. The children are back at school and deadlines beckon so it’s time to focus on the tasks in hand but first I’d like to share my New Year’s day outfit, my New Year’s resolutions and a few snapshots of what my Christmas entailed (and I really do mean a few snapshots because I was so busy enjoying myself that I forgot to take many photographs). New Years Day was a lunch at my parents’ home, so it was relaxed and informal. 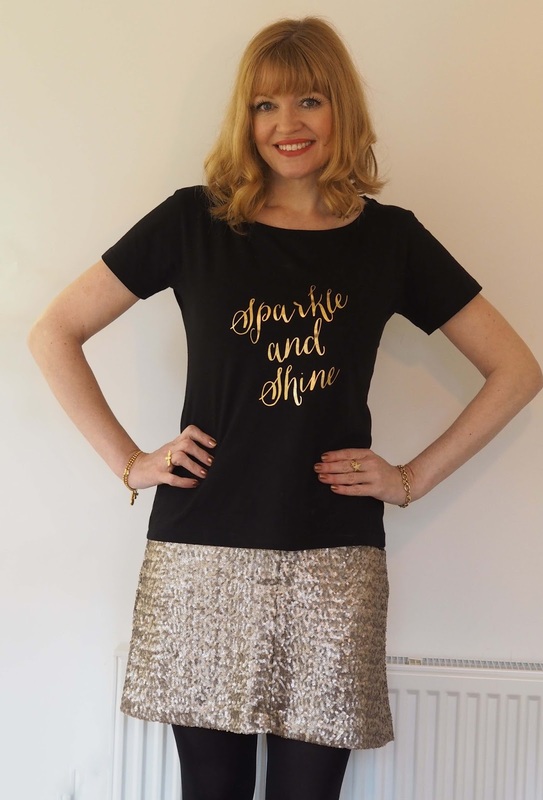 I decided to go for sparkle because I had just bought the gold sequinned skirt in the Next sale and was keen to wear it. I always think the sign of a good purchase is when it gets worn within a day or two. The tee-shirt is a design I saw and “liked” on Instagram (@wishtshirts) and the woman behind this small independent business very kindly sent one to me. 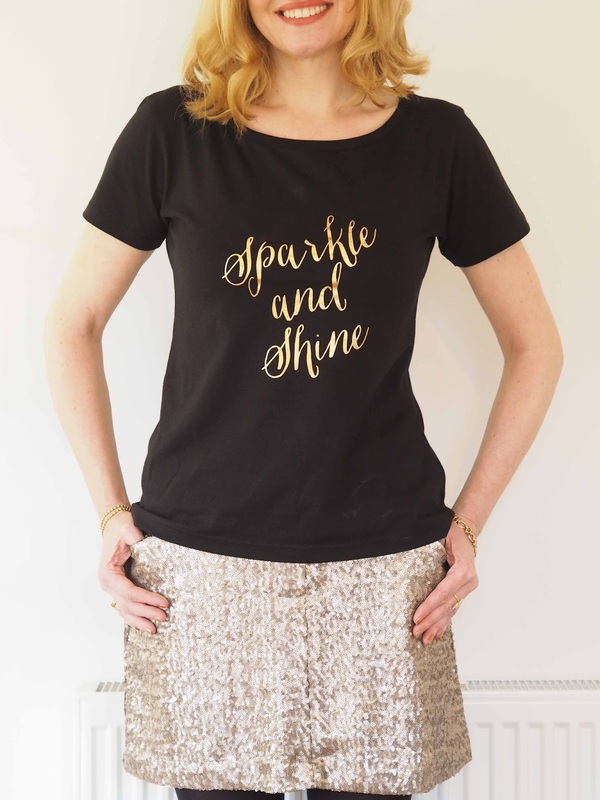 I absolutely love it and to Sparkle and Shine throughout 2017 is something I’m definitely aiming to do. (Outfit details including links are at the foot of the post). I don’t have many resolutions, but one is to learn to speak Spanish- enough so I can get by on holiday. I always loved languages but my education took me via a science route, so it’s something I feel is missing. I fell in love with Nerja last year and foresee spending more time in Spain in years to come. This is something my boyfriend and I are hoping to do together at a night class, not least to ensure we meet at least once a week, (logistics, family commitments and his travel for work mean we can’t spend as much time together as we’d like. He has a very good working knowledge of Spanish so I’d be playing catch up though!) If we can’t arrange this though, there are plenty of good apps to enable me to learn at least some of the basics. 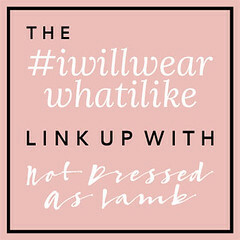 This year I’ll continue to steer my blog forwards and I hope to work regularly with those brands that I love. 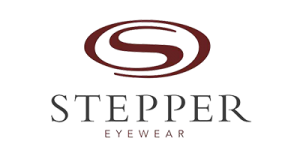 2016 saw regular collaborations with Kaleidoscope, Dash Fashion and Tulchan and these will be continuing for the near future at least. On a similar note, we, the Over40Collective will launch our website and will be looking at working closely with brands aimed at our demographic and it’s something we’re very much looking forward to. And…dare I hope to reach 20k followers on Instagram by the end of 2017? My hope had been to reach the magic 10k followers by the end of 2016. Well, it happened. Three days late but it did happen and I was thrilled. 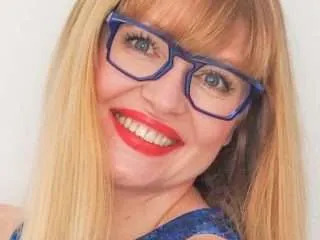 It’s a lot of work, but it’s the social medium I enjoy the most so a huge thank you to those of you who follow, comment and interact on both my blog and social media. It really does mean a lot and it really does make a difference. Boxing Day was at my house and there were 16 of us, so I did a cold buffet of meats, cheeses and salads. It was brilliant, really brilliant to have my close family here along with my boyfriend and my gorgeous friend Sue and her children. Here’s to a fantastic 2017. I hope it’s filled with love, laughter, family, friends and good health because that would make for a very, very happy new year. High-heeled suede ankle boots, Clarks, previous season. 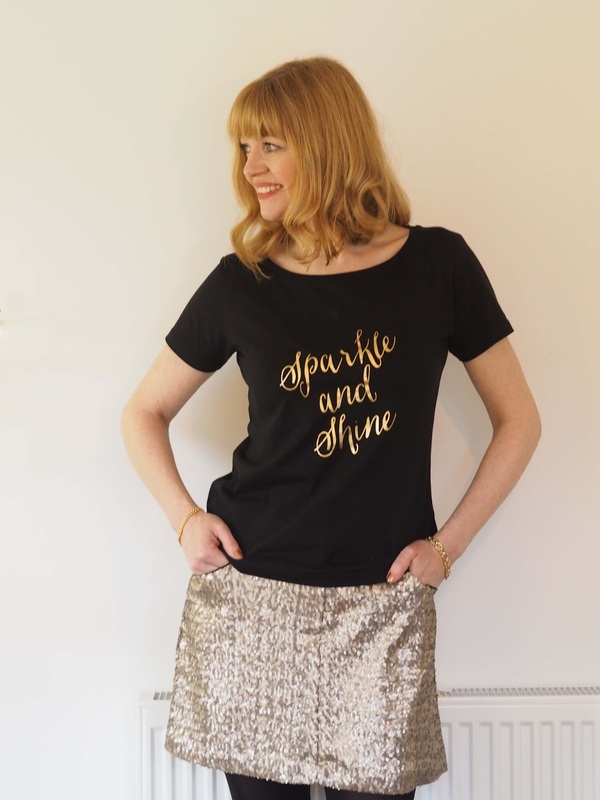 Liz only you could make a simple black logo tee and mini skirt look this cute and fabulous!! I think it's wonderful that you're thinking of doing Spanish with the BF, I've ALWAYS wanted to learn. I wish you even more wonderful stuff and success in 2017, I can't wait for our O40Co launch which will be soon I hope!! Well you sparkles during the Holidays! Fabulous! 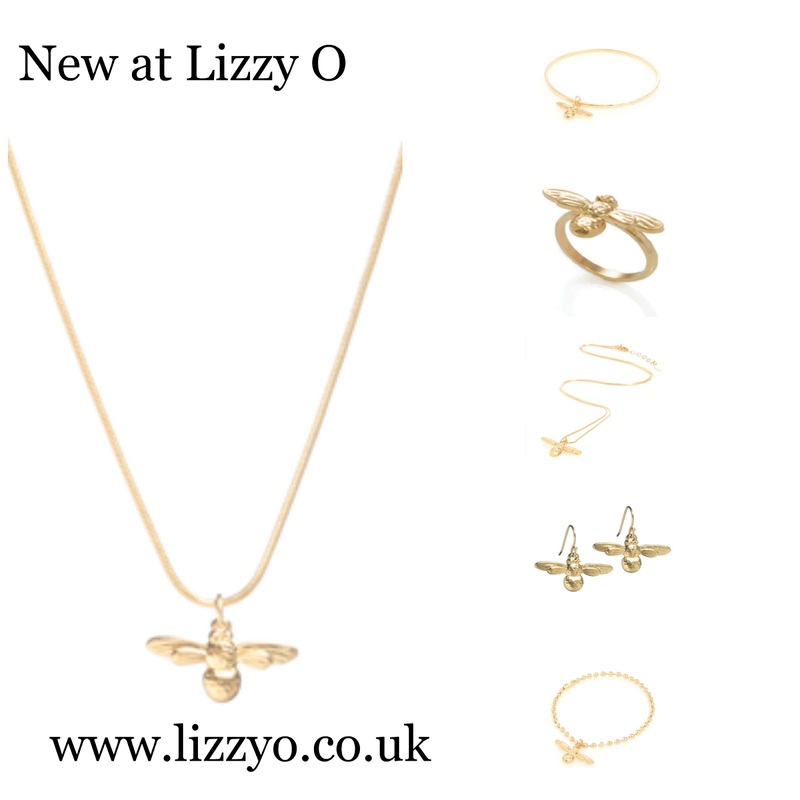 When you het the dragonfly necklace in gold, please let me know! I finally (after year of questioning) bought a sequin top and … well. What took me so long ! !